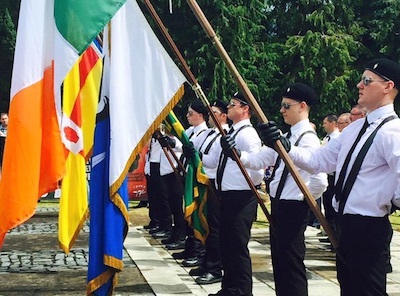 Last weekend, the 32 County Sovereignty Movement held its annual commemoration to the father of Irish Republicanism - Theobald Wolfe Tone, in Bodenstown Graveyard, Sallins, County Kildare. The commemoration was well attended and was represented by Republicans from across the 32 counties of Ireland and Scotland. Below is the full oration delivered by Francie Mackey, Chairperson of the 32CSM. “I find here implicit all the philosophy of Irish Nationalism, all the teaching of the Gaelic League and the later prophets. Next year we will stand at the grave of Pearse and in recognition of one hundred years since the efforts of the men and women of 1916 we too must address the question of the accomplishment of Tone’s vision. That vision does not belong at a graveside, it belongs amongst the people of the nation; in the integrity of their national sovereignty and in the dignity of the sovereignty of their citizenship. To follow in the steps of Tone, as Pearse urges us to do, is to place in our care the onerous responsibility of moving Tone’s vision forward. And only by moving it forward can we claim to have discharged that responsibility in a fitting manner. Our republicanism must be defined by our activism in its pursuit. Our activism must be the spearhead of all our political strategies. It is not enough to claim to be republican, it is not enough to align ourselves to historical events or form an association under a green banner. All claims to republicanism must be synonymous with its rigorous pursuit. The 32 County Sovereignty Movement has established the first. The Submission to the United Nations sets out the terms for peace in Ireland. It does so with reference to the root cause of the conflict, the violation of Irish national sovereignty. But it also lends itself to adoption because it is not a party political document. It is not confined by organisational constraints. It does not require any prior political allegiance to support its basic premise. There is no claim to ownership over it. It is a national and international expression of our lawful right to national sovereignty and as such is the property of the Irish people. We once again urge all republicans to recognise the UN Submission as a basis to move forward with all our combined strategies and political ideas at our disposal. The building of a political movement as a vehicle to advance republican goals is the shared responsibility of all republicans. All constituted republican organisations deserve the equality and respect for their contributions to such a movement. Leadership in a revolutionary struggle is derived from comradeship and not control. The veracity of political strategies is predicated on the existence of organisational structures which are fit for purpose. Without comradeship Irish republicanism can never advance its goals. The republican base is clearly fragmented. That fragmentation has more to do with an absence of comradeship than it does with political or ideological differences. We need to be honest with ourselves on this point; we cannot pay lip service to ideas of republican unity or building political vehicles whilst comradeship is lacking. The parochial mindset is the bane of Irish republicanism. It has stifled growth, fuelled suspicion to the point of destructive mistrust and has gifted our enemies with the perfect mechanism to deter our people to stay away from this struggle. And the absurdity of this state of affairs is most clearly demonstrated with the plight of republican prisoners. Their cells all of have steel bars yet we segregate them into sub-groups and divide and undermine our resources in catering for their needs and the needs of their families. Republican prisoners, as members of the national army, are the responsibility of the nation and all people of our nation have the inalienable right to support them in whatever way they deem appropriate. You cannot claim to be fighting on behalf of the Irish people then demand of those people a narrow political agenda when it comes to seeking their support. The task facing all Irish republicans at this point in our struggle is to rebuild a real sense of comradeship before we entertain any notions of republican unity. One cannot happen without the other. The first step to be taken in this process is to acknowledge the legitimate right of different republican organisations to exist and to make it a republican principle to both respect and interact with each group to advance republican objectives. Equally we must accord due respect to the ideas and strategies of all republican groups to the point that any disagreement on aspects of such ideas does not automatically lead to entrenched positions. No group has a monopoly on any aspect of Irish republicanism not least when we must recognise that the over arching issue which binds us closer together is our collective failure to realise our goals. But before us lies an unprecedented opportunity to reintroduce that sense of comradeship that is desperately required. The centenaries of the most important events in the republican calendar are upon us. I call upon all republicans and socialists to carefully take stock and reflect on the magnitude of the next number of years. Take stock of where we politically find ourselves, our resources and structure and reflect on how working together with a renewed sense of comradeship can advance our shared objectives. We are a small fish in a very large pond and in such circumstances being right is simply not enough. And yet we cannot simply revert to parochial commemorations and allow the counter revolutionary forces to dominate and control national events. They have already initiated their programmes to cover these seminal centenaries and all are geared towards a revisionist interpretation. For them these centenaries are an awkward reminder that what those men and women fought for they are in default of. For us these centenaries are a stark reminder that we have failed in our endeavours and more so because we claim their mantle. For republicans these events represent a challenge. That challenge must be taken up based on comradeship and mutual respect. Our meagre resources must cooperate with each other to mark these historic watersheds in the republican separatist manner in which they themselves were initiated. 2016 is a start point. From there we see the evolution of the republican project. The democratic endorsement of the 1918 General Election follows closely on. From there we have the establishment of Dail Eireann, the Declaration of Independence, the War of Independence, the Second Dail and the Anglo-Irish Treaty.